Second row Lloyd Ashley will lead Ospreys while regular captain Alun Wyn Jones is on World Cup duty with Wales. The 24-year-old has previously captained the region at age grade level and in LV=Cup matches. Former Lions Test captain Jones is likely to miss the first two months of the new season on national team duty. "With Alun Wyn away, Lloyd is a great fit to lead the team, he gives everything for the cause," said head coach Steve Tandy. "He really does follow Alun Wyn's lead to take up the mantle while the internationals are away." Ashley made headlines in the summer of 2015 when he changed his surname from Peers following his marriage. Jones is one of 10 Ospreys currently preparing for the World Cup with Wales, plus two in the Canada squad and Josh Matavesi with Fiji. The World Cup starts on 18 October with the final on 31 October. 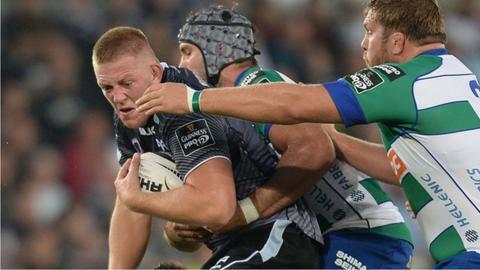 Ospreys start their Pro12 campaign away to Ulster on Friday, 4 September with Munster visiting the Liberty Stadium on 13 September for the first home game. Tandy says there is pressure on players to perform in the opening weeks of the season. "It's not just about Lloyd leading the team," he said. "It's important that other players step up and play their part. "You look at the squad and it's pretty clear that Lloyd will have plenty of support across the park, despite the youthfulness of the wider squad. "There are people like [Joe] Bearman and [Gareth] Delve in the back row, natural leaders who people will follow, and in the middle you have [Jonathan] Spratt and [Ashley] Beck."